Our coverage of Android P wouldn't have been possible (or, at least, would have been much more difficult) without the help of all our tipsters, we ❤ you. Together, we've spent quite a lot of our time playing with Android P to show you all its new features, following along with every developer preview as we hunt for changes big and small. Now that Android 9 Pie has been finalized and released, this list isn't likely to change too much, so consider this near-final. For both your and our convenience, we've put everything we've found together into a list with (very) brief summaries. 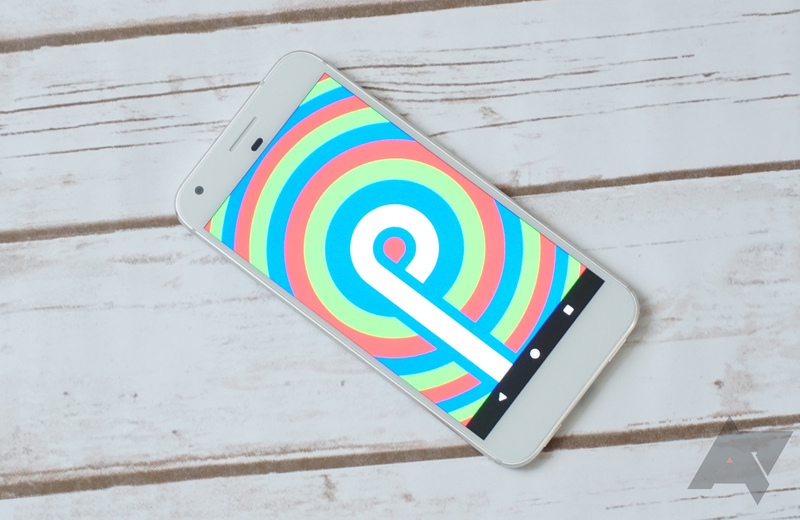 That way you can catch up if you've fallen behind with our Android P Feature Spotlights. Inline photos and smart replies: Remember Reply? Now you have that built into Android. Developers can also add support for showing things like images and stickers in-line as well. Update: DP2 added support for this feature on the OG Pixel, as well as general improvements in both the editor and notification. Volume buttons control media volume by default: Android does a lot of things really well, but audio management probably isn't one of those things. Your hardware volume keys control different things, without much of an indicator until you actually press one. Now by default, it's set to change media volume, as opposed to the ringer (as in Android O and before). Simultaneous connection of up to 5 Bluetooth audio devices: The limit in 8.1 was two, one for calls and one for media. But with P you can allow up to five devices to be connected at one time. No simultaneous playback, though. Temporary rotation lock: A bit difficult to explain, but when you have rotation locked in portrait, a new icon appears on the nav bar when you turn your phone sideways that will quickly toggle to landscape, and vice-versa. Google continues to tweak how this particular feature works. As of DP4 it gets a more prominent placement in the gesture navigation, where the old app switcher button once lived. The icon has also changed to no longer match the quick settings rotation lock, which makes sense, considering the functionality is different. As of Android P DP5, the icon has also been tweaked. Alarm quick settings toggle: There's a new Alarm tile/toggle in quick settings. It shows the next alarm, gives you a shortcut to all currently set alarms and allows you to easily set new ones. Update: And it's gone as of DP2, replaced by a bit of text above the brightness slider that shows your next alarm, if you have one. App notification tracking: If you get an annoying notification, you can easily track down which app it came from. That should help cut down on notification spam (if you have problems with that). Wired charging sounds: Google never fails to impress. They've managed to miniaturize the machine that goes ping into the Android P developer preview, triggering it every time you plug your phone into power. Ah, technology. Update: The sound has changed as of DP2. Chrome-like 'feature flags': You know how Chrome has a bunch of extra options called "flags" for enabling testing features or tweaking things? Now Android has the same thing, called "feature flags." Basically, all the unstable testing stuff with convenient toggles in one spot. Pulling down the notification tray results in vibration: Pretty simple. When you pull it down, you get a bit of haptic feedback. Text selection, image sharing, and other interactions via the app switcher: DP2 tweaked how the recents/app switcher UI works, allowing you to actually interact with content in the previews, including things like copying text and pulling images (even from apps that otherwise try to block that behavior). The feature originally wasn't enabled for the 2016 Pixels, but for a short period, Google did turn it on for those devices. However, we're told that was a mistake. As of DP4, it has been turned back off. Whatever we were told, Google has decided to turn things back on as of the full, final release of Android P (which is Pie), and the feature has returned to the OG Pixels, though it only works if your language is set to US English. Offers to hide frequently dismissed notifications: If you keep dismissing the same notifications over and over, Android P will ask if you'd prefer to just have them be hidden. Gesture Navigation: Like it or hate it, Android P DP2 introduced a new gesture-based navigation system (that was previously leaked by Google itself). It isn't a default yet, but it's certainly polarizing. DP3 made a few tweaks to how gesture navigation works and added a convenient tutorial (since it is a bit confusing and unintuitive, visually). DP4 further changed the icons for the navigation/gesture bar, just a bit. New App Switcher: Gone is the vertical list of recent apps, replaced in DP2 by a horizontally scrolling gallery. It even works with the gestures which arrived with the same update. Interestingly enough, it's actually a part of the launcher. DP3 overhauls the recents menu/apps switcher with some translucency tweaks and a rebounding animated effect. DP4 further changes the slider for app-switching to be the full width of the screen, also increasing the size of the previews in the app switcher, making them fill most of the screen in the app switcher. App Actions: Detailed at I/O, App Actions are sort of like the existing app predictions in the Pixel launcher. But instead of simply recommending your next service, they take things one step further by recommending your next action. Developers need to build specifically for this, though. Google added support for this feature to the 2016 Pixels as of DP4. Previously it was only available on the Pixel 2s. Ring mode shortcut: Pressing the power and volume up keys together triggers a customizable command that enables the Vibrate or Mute modes. Accessibility Menu: We can't actually find it yet, but Google assured us at I/O that P would include a new menu for motor-impaired users in the form of a convenient navigation bar shortcut. It arrived with DP3, and we first spotted it in DP4. It adds a new option for a menu in the navigation bar that provides a more accessible means of getting to specific gesture or multi-button operations like screenshot or Assistant, which may be a bit difficult for those with disabilities to trigger. Weather on the lockscreen: As of DP2, the local weather will be shown under the clock. Note, a later update to the Google app appears to have broken this in the short-term. DP3 has fixed this again. At least, for the time being. Calendar events on the lockscreen: It was previously part of the Pixel launcher, but now upcoming events in your calendar have joined the weather on the DP2 lockscreen. Again, a specific update for the Google app broke this. Only the version DP2 shipped with allows it to work (for now). Again, fixed in DP3 (for now). Weather comes in, calendar events go out, can't explain that. DP4 seems to have randomly broken/fixed this feature for a few people, YMMV. Automatic Color Adjustments: Discovered in some recent teardowns from DP2, it is rumored that the Pixel 2 may be able to dynamically adjust calibrated color modes based on content. Android P will be Android 9: The version number increment in Android P will be a major revision, with a move from 8.1 to 9. Camera laser sensor toggle: Added back in DP1, but unnoticed until DP3, Android P adds a toggle in the developer options for disabling the Pixel's camera laser sensors. Automatic 24-hour time format: Some countries use 12-hour time, others use 24-hour time. As of DP4, Android P can switch between the two automatically based on location rather than a binary, user-configured toggle. P stands for Pie: No ".0" follows version 9, either. Digital Wellbeing beta lands with Pie: Initially revealed at I/O earlier this year, Google's suite of notification mitigation and device use reduction/statistics finally debuted shortly after the final launch of Android 9 Pie. Display cutouts are supported (i.e., notches): The ZenFone wasn't a fluke, looks like we can expect more phones in the style of the iPhone X, and Android will have software support for them. Time is on the left side of the status bar: Probably to accommodate notches, Google has decided to move the status bar clock to the left. The date has also been moved down a bit into the quick toggle area as of DP3. Pixel Launcher, new mic icon, separate tab for Android for Work apps: Google's constantly making little tweaks to the Pixel launcher. Android P brings a few small visual changes, like a new shaded background (gone in DP2) and mic icon for the search bar, plus a new app dichotomy in the form of two tabs, separating Android for Work apps from personal ones. Update: The shaded white semi-transparent background for the dock is gone in DP2, there's a new rotation button, and the aforementioned App Actions have been integrated into it, as well. New colors and tweaks in Settings: It's bright, friendly, and colorful, à la old-school TouchWiz. You'll probably dig it. Ambient Display shows battery percentage, centers notifications: Notifications are centered in Ambient Display, and you can finally see battery level without turning on your phone. Night Light toggle shows active time: Don't know when you set Night Light to trigger? Now the toggle/tile in quick settings will say. Quick settings scrolls vertically: pagination is the devil, so with P all your quick settings toggles and tiles can live on one scrollable page. Volume slider repositioned to the side of the screen, Bluetooth devices listed: Like the power menu in Oreo, Google has moved the volume sliders to be near the buttons that control them, and Bluetooth device volumes are conveniently accessed from the new interface. Dat Easter egg, tho: In nine states you can have a comfortable night in with the psychedelic new Android Easter egg. New cell selection animation: Tiny tweak, but the radiating cell select animation looks a bit different. Power menu screenshot button: This has been in many a custom ROM over the years, and it's more convenient than the hardware key combo. Good to see it hit Android proper. Battery saver no longer makes things orange: It wasn't the most attractive look, but it did catch your attention. The notification is still present, though (and probably enough of an indicator). Unlock pattern fades as you swipe: As you enter your pattern, the trail behind your finger will fade away. Update: New bouncy, bubbly heads-up notifications animations as of DP2, too. Text selection tweaks: Google seems to have decided that the various all-caps text elements in Android were a bit much. Now the text selection dialog isn't constantly yelling (and the "Web search" button is out of the menu). Force stop/app version hidden: no functionality has been changed or removed here, but in Android P the "Force stop" button and has been sequestered into a menu button, and app version is in an "advanced" section. Adaptive brightness: The brightness slider moves in real time to reflect display brightness when set to Adaptive. Update: It's also powered by AI, apparently. Presumably, that is new functionality as of DP2, but it's possible it was in DP1 as well. As of DP3, the slider is also logarithmic in scale, though it's still incorrectly linearly mapped, resulting in some jumps between lower settings. New/updated Emoji 11.0: 157 new emoji from the updated standard made their way into Android P via DP3, adding things like Lobster, Mango, Hot Face, and Bagel with Cream Cheese. Some other emoji were also tweaked to be better. New colorful fingerprint enrolling animation: The enrollment process is unchanged, but it has a snazzy new coat of paint. Notification reply UI has new icon: The arrow that indicates an opportunity to reply in Android is a bit thinner in DP3. Darker/less transparent app drawer and Google Feed: DP3 adjusts transparency for the background-based adaptive dark theme used by the Feed and app drawer, making them much darker. Clock icon in recents menu/app switcher shows actual time: A small tweak as of DP2, but it's a nice bit of visual consistency. Quick settings toggles are no longer expandable: Some items in quick settings, like the Wi-Fi shortcut, used to be able to expand into a simple selector for quick changes, like swapping networks. As of Android P DP1, that is no longer the case. Do Not Disturb is one setting, not three: "Total silence," "Alarms only, and "Priority only" are all gone, there's just one Do Not Disturb mode. At least you can configure it to individually match any of the others. Do Not Disturb hides notifications: In the latest DP2 update, Do Not Disturb also prevents most notifications from appearing at all, replacing them with a "Do Not Disturb is hiding notifications" disclaimer in the notification shade. DP3 simplifies these settings a bit more, with fewer options for blocking notifications shown by default and a slight reorganization, plus a new pop-up that warns about the changes. Location accuracy is all or nothing, no "battery saving" mode: "Battery saving" mode is gone, location can either be set to use all connectivity options or only GPS. Battery saver has too many names, configurable percentage trigger: Battery saver has three names, including "Reduced power mode" and "Low Battery Mode." You can also set it to trigger at any level between 5 and 70%. Notification-type vibration configuration: You can individually change or disable vibration for calls, notifications, and touch. DP4 has made each setting a binary affair, with only on/off, rather than the previous (and non-functional) high/medium/low settings. Simultaneous file transfer and charging, USB menu tweaks: USB-related stuff is consolidated into a single menu, and you can also simultaneously enable file transfer and charging. Battery menu nerf: Per-app metrics and the Android O-style battery graph are relegated to a developer option. System UI Tuner is gone (for now? ): Maybe it'll come back in the future, but the System UI Tuner and its various tweaks aren't present in Android P. It's still there, but it is hidden. Tag Wi-Fi networks as metered from network details: This option was previously hidden away in the "data saver" section, having it on network details in settings is a bit more intuitive. Apps built for 4.1 and lower may not work: The Play Store already has its own restrictions in place, but devices running P won't allow apps targeting Android 4.1 and earlier, even for sideloaded apps. Bluetooth icon disappears from status bar when not in use: Saves you space when Bluetooth devices aren't connected. Picture-in-picture mode has a settings icon: Easily access the PiP settings for an app to enable or disable the feature. Android Auto Wireless: Previously a Nexus and Pixel-exclusive feature, Google revealed at I/O that it will be coming to all Android P devices. Split screen UI tweaks: With the redesigned app switcher/Recents/Overview in DP2, Google also changed how split screen is triggered. Unlike DP1, it's triggered by tapping the app icon which appears above each preview and selecting "Split screen." By default, replying to a notification no longer dismisses it: It was optional in Android N, but as of Android P DP2, it appears to be the default behavior. Interacting with a notification to reply to it no longer results in it being dismissed. Manage notifications shortcut: At the bottom of the notification shade is a new shortcut that takes you to the app notifications settings screen, previously accessible via Settings. Low battery notification tweaks: As of DP2, rather than provide you with the remaining estimated time, the "Battery is low" notifications will tell you the approximate time it will last until (e.g., "12:00PM" rather than "45 minutes"). Android TV setup improvements: When P hits Android TV, a host of convenient tweaks for the setup process will also be delivered, including app suggestions, password auto-fill, and an easy phone-based shortcut for the setup process. System notification management: As of DP2, you can even control notifications from system apps, like System UI or Android System, meaning you can block things like battery or storage alerts from appearing—if you feel the need to. Max of 4 visible notifications in Android P DP2: Not all progress is forward. Likely as a result of the expanded notch support, DP2 cut the number of notification icons you can see from a maximum of around seven to four. "Clear all" button gone in app switcher: Removed from DP2 (presumably as part of the switch to the new gesture/multitasking UI), we're told the feature will come back in a future beta. As expected, the "Clear all" button is back as of DP3. Color profile picker reference photo: It's... not a very good photo, but now the Color section in settings has a reference photo so you can see what the change you select looks like. DP3 has tweaked that photo, and the new one is quite a bit better. Fingerprint scanner can keep phones awake: Android P DP2 and forward accept input in the form of touching the fingerprint scanner to keep the display on, suspending the timeout count. Battery Saver persists after charging: In previous versions of Android, Battery Saver turns off when the phone is plugged in and stays off if it is unplugged. In DP2, it turns back on when power is cut. Kiosk mode app launcher: Android P gives devices set in kiosk mode a launcher for multiple app use. Home screen rotation in Pixel Launcher is back: The option to enable rotation of the Pixel Launcher split in DP2, but it has returned in DP3. Ringer/alarm volume positions switched in settings. Bluetooth settings tweaks: Android P DP3 adds a new "Previously connected devices" section in Bluetooth in settings, separating those devices (which could be a long list) into their own area. "Add device" is now "Pair new device," and the Bluetooth toggle has been relocated. DP4 further reorganizes the Bluetooth subsection in Settings, moving it into the Connection preferences section along with the NFC toggle. The Bluetooth file transfer history location was also moved there with it. Wear OS volume indicator: The ring volume option in settings now indicates if it's being affected by a paired Wear OS device. "Downloads" app is now "Files:" just a slight rename of the app in the drawer. Hotspot automatically turns off when no devices are connected: Android P also adds an automatic function to turn off your phone's hotspot, if enabled, should no devices be using it for a certain period. As someone that's left their device switched into that mode and running frequently, this is an excellent change. Dark/light Pixel Launcher theme toggle: Initially introduced in Android 8.1 for Google's Pixel devices (starting with the 2 and 2 XL), Android P DP4 has added a manual toggle for the light/dark themes in the Pixel Launcher. No longer will you be subject to the whims of your background for the launcher theme. Direct Share targets trimmed to 4 from 8: The default share menu used by most apps when you tap the three connected dots icon now shows only four direct targets for contacts/apps rather than eight, as it did previously. Changes in iconography, removing fill: DP4 has tweaked icons throughout Android, from the quick settings toggles to the settings app, changing them from filled-in icons to outlines, increasing contrast and, presumably, legibility in the process. The size and spacing of status bar icons were also subtly tweaked, probably to better accommodate future notched phones. Google Pay broke for a bit: The DP4 update broke Google Pay for a short time, but it appears a fix rolled out for SafetyNet that removed the associated test failure. Call volume gets its own slider in Settings: Previously changing call volume was a bit tedious outside an actual call, but now it has its very own slider in the Settings app, as of DP4. Mobile data quick settings prompt disappearing: YMMV, as some are still seeing it appear, but the confirmation for disabling the mobile data quick settings toggle has generally disappeared as of DP4. WPS authentication is temporarily dead in DP4: It's an insecure method of authentication, but some people still relied on WPS to add devices to their networks. DP4 seems to have removed the option, but according to a statement on the issue tracker for the problem, Google plans on fixing it in a future release. Homescreen reordering removed from Pixel Launcher/Launcher 3: Android P looks to have also killed homescreen reordering in Launcher 3-based launchers, including the Pixel Launcher. Microphone button removed from search in the Pixel Launcher: DP5 has streamlined the look of the homescreen for those using the Pixel Launcher, cutting the superfluous microphone icon/shortcut that lived at the right edge of the search bar/widget. Fix for Wear OS phone call audio bug: Bluetooth call audio is broken when using a Wear OS device for many, but apparently Android 9 Pie includes a fix for this issue (only 10 months late). Apps can no longer access mic or camera in the background: Probably not great that they could do that before, but for the privacy-conscious, now you can be sure they aren't. Update: As of DP2, notifications will show if the backgrounded app has requested permissions including the use of your camera or microphone. Fingerprint dialog consistency, unencrypted HTTP block for some apps: Google has introduced a new API for fingerprint sign in, hoping to make things more visually consistent when apps ask for your digits' details. Android P also blocks by default all cleartext traffic for apps that use Network Security Configuration, though it can be individually disabled per-domain if need be. Lockdown option to disable fingerprint sensor and other less secure login methods: A new "lockdown" option in the power menu disables potentially involuntary methods of entry into your phone. When enabled, no one can use your voice, fingerprints, or location to get inside. MAC address randomization: Helps prevent tracking on public networks. Long overdue, even if it's just an experimental feature right now. More granular phone permissions: A new permissions structure in Android P moves the call log permissions into their own group, so apps can't see your call history without a separate request. The change in permission structure should also prevent potential phone redirects. HDR VP9 and HEIF formats supported: More efficient formats for storing video and images are natively supported by Android P.
Multi-camera API, display-based flash, and other camera API additions/changes: Can be used for simple things like portrait mode parallax/depth detection, AR, and other cool stuff. Measure distance to Wi-Fi access points: New location system for more precise indoor positioning. New autofill APIs for password managers: Password managers are so hot right now, and Android P will have even better support for them. ART improvements—apps start faster using less memory: ART was introduced in as a replacement for the old Dalvik in Android 5.0 Lollipop, and in Android P it's better than ever. Google <3's Kotlin: At 2017's I/O, Google revealed support for Kotlin, and as of 2018 and Android P, apps for Android written in the language will be faster. More neural network/machine learning APIs: New hardware acceleration for neural network operations, and an expansion in API functionality. Slices: Related to the App Actions mentioned above, Slices are a bit like Intents, but turned up to 11. With them, apps can directly share functionality, effectively embedding part of an app (or, at least, information from it) inside another. Vulcan: At I/O, Google confirmed that Android P would have support for v1.1 of the low-level API. BiometricPrompt API: The old FingerprintManager API has been bundled together with iris and face authentication methods into a new API, deprecating the old one. New "key rotation" feature for signing APKs: Now multiple keys can be created from a single source key, allowing for easier sharing of APK signing keys in groups/teams of developers. So far, these are all the new features we've found in Android P, but be sure to check back in if you're following our feature spotlight coverage. And, as always, tips for undiscovered features are welcome. All the things we've found in the recent Android P DP3/Beta 2 are also now included. DP4/Beta 3 may have been a bit more lightweight on changes, but we still tracked them down to add to this list. Both DP5 and the final release landed in quick succession. There aren't too many changes on top of what we've already seen, but we've got them all here. Welcome to Android 9 Pie.